On January 8, 2008, I added a post titled ~ Put Your Loose Change Here. In that post I cleaned and restored a Bankers Pen Company Coin Filler. I also discussed the history of the pen (c~1911), including patents for the feed and even some history of the 1 Madison Ave address. I have reposted some of the photos of the pen and its components below for comparison, but will leave the link above to the old article to cover the restoration and history behind the pen. 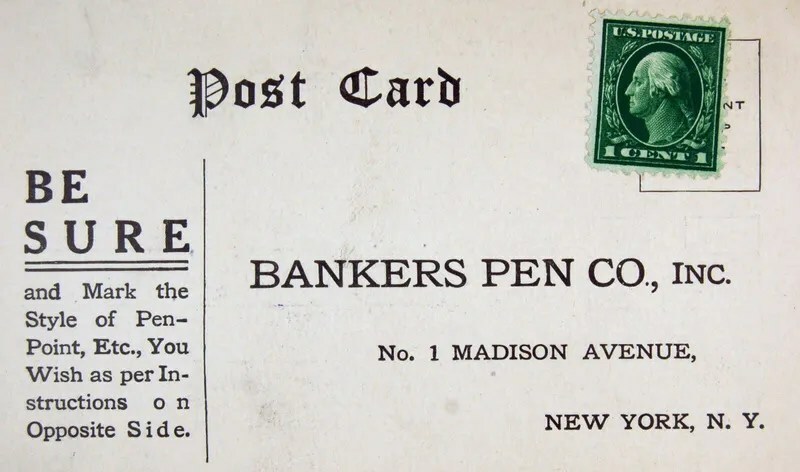 I picked up the Post Card below recently as I remembered my coin filling Bankers Pen and its address. So, I purchased the card and here are photos of the front and back. The seller told me that the card came from an attorney’s office remains. The attorney, H. E. Grosshans, practiced in the early 1900s and this fits with the order card and the dates of Bankers Pens such as the one below. It appears that Mr. Grosshans considered sending in the order form, but may have simply put it back in his desk to be discovered ninety years later. As you can see, Bankers offered two price ranges ($3.00 and $2.00) as well as three choices of nib (Medium, Fine, and Stub). The opt out, or “I don’t know” style of nib was medium. 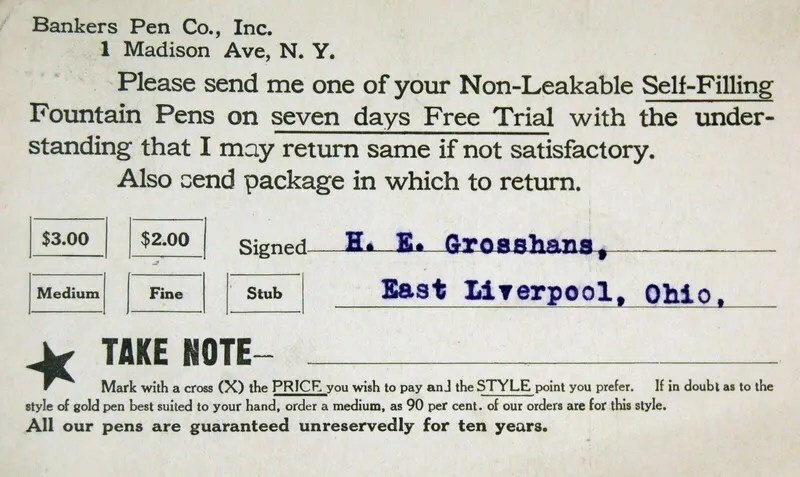 The reason that this pen, or another self filling style of pen was potentially what Mr. Grosshans would have received is that by 1917, the Bankers Pen Company had moved to 76th Fifth Avenue. Please see the Manhattan Pen Makers Project (link), for a reference to this. This is an excellent reference site for NY Pen Company addresses. I do not have access to the advertisement or solicitation that would have prompted the return of this card, but it is fun to match up a pen and some ephemera. My next quest will be to find a Bankers advertisement from the same time period, prior to the move to Fifth Avenue. Below are photos from the January 2008 article as well as a link to Schnell’s feed patent, filed and issued in 1904. So, the search continues for a Madison Avenue era Bankers Advertisement. If any of you know where to find one, I would love to hear from you! Nice blog. I have a collection of fountain pens. But the thing that make me confused is that, is there any reason in buying pens for commercial purposes?